Former Auburn QB Nick Marshall covers his former teammate Sammie Coates in practice. Marshall created a buzz when he decided to work our as a corner instead of quarterback. The Senior Bowl signals the real start of the NFL Draft season. The week in Mobile, Alabama is the first premiere event in the evaluation of players for the draft. What I really like about Senior Bowl week is that you get to see players compete against each other one on one. At times it’s hard to give a fair grade to an offensive lineman because they are all working together as a unit. However, if you get him one on one against a defensive lineman, you can see his strengths and weaknesses. Brian Bennett, QB, SE Louisiana (6-3, 215): Former backup at Oregon. Impressed coaches when he jumped on a red-eye flight from San Diego to participate when Nick Marshall decided to play corner. Had better stats in 2013 than in 2014, possibly from shoulder issues. Was the Southland Conference Offensive Player of the Year. High football IQ. Improvises well when the play breaks down. Very athletic. Good arm. Completed 5 of 10 for 80 yards and 2 INT. Also had 2 rushes for 6 yards. Blake Sims, QB, Alabama (5-11, 223): Former running back with the body of a running back. Athletic. Lacks great ball placement. Hard worker. Moves the chains with his feet. Good timing and anticipation. Better arm than you think. Great ability to feel the rush and elude the pass rusher. Better on the move than in the pocket. Completed 4 of 11 for 50 yards and had 23 yards rushing on 3 carries. Garrett Grayson, QB, Colorado State (6-2, 214): Underrated. #4 in the country in passing yards (4,006) and #5 in the country with a QB rating of 166.22. Good arm with good zip on the ball. Big hands which help him grip the ball. Throws the ball in rhythm and gets rid of quickly. Moves well in the pocket and can extend plays with his legs. Can put the ball into tight windows. Has smooth footwork on his drops. Does a good job reading defenses and checking the ball down. Was voted Best Quarterback for the week. Completed 8 of 15 for 118 yards. David Johnson, RB, N Iowa (6-1, 224): Big body. Great receiver that had 203 yards receiving against Iowa. Able to split out and run receiver routes. Although he has good size, he is better in space than he is running between the tackles. Weaves his way through traffic. Nice jump cut. Was voted the Best Running Back for the week of practice. Led the South team in rushing with 10 carries for 43 yards and 1 TD. Had 1 catch for 16 yards. Returned kickoffs and punts and had a 38 yard kickoff return. Cameron Artis-Payne, RB, Auburn (5-10, 212): Better hands than you think. Didn’t get many opportunities to catch the ball for the Tigers. Good size. Has burst through the hole. Patient and does a good job picking his holes. Good power. Nice cuts in traffic. Had 10 carries for 43 yards and 3 catches for 35 yards. Jalston Fowler, FB, Alabama (5-11, 264): Dominating lead blocker that can pancake defenders. Versatile player that can help out in the passing game. Runs good routes and has good hands. Phillip Dorsett, WR, Miami (5-9, 183): Explosive speed. May be able to threaten Chris Johnson’s NFL Combine 40 record of 4.24 seconds. Accelerates so quickly, it looks effortless. Has the speed to blow right by coverage. Very smooth and has great moves. Very quick in and out of his breaks. Voted the Best Receiver for practice week. Tyler Lockett, WR, Kansas State (5-10, 181): Holds all the Kansas State receiving records. Slight build, but very quick. Game breaking speed. Great moves in space. Good hands. Great concentration and body control. Has the ability to return and cover kicks. 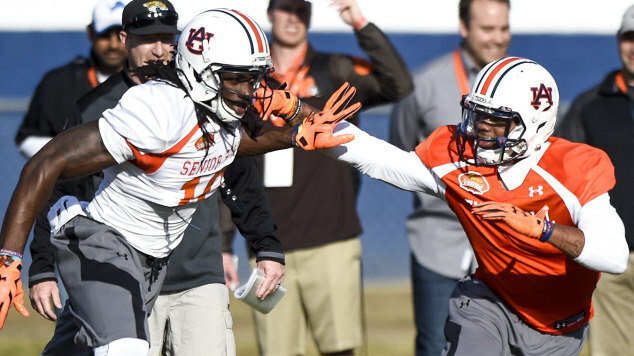 Sammie Coates, WR, Auburn (6-2, 213): Great build. Great speed. Shields off defenders. Has played and delivered in big games. Has the ability to catch the ball over defenders. Needs to work on his hands and concentration. Had 1 catch for 13 yards and was called for a pass interference penalty. Dezmin Lewis, WR, Central Arkansas (6-3, 215): Good size. Extends his hands and makes the catch before it gets to his body. Southland Conference Player of the Year. Led the South team with 3 catches for 59 yards and had a long gain of 24 yards. Had a big catch on 4th and 6 to get the first down. Rannell Hall, WR, Central Florida (6-0, 193): Had a very good week. Great hands and body control along with an ability to make circus catches. Versatile receiver that can line up in the slot or outside. Has the ability to stretch defenses. Great ball skills. Catches the ball at its highest point. Able to return kicks. Had 2 catches for 44 yards with a long gain of 32 yards. Clive Walford, TE, Miami (6-4, 254): Combination of size, speed and athleticism. Tough matchup. Uses his big body to shield off defenders. Finds soft spots in coverage. Had 1 catch for 10 yards. C.J. Uzomah, TE, Auburn (6-5, 263): Didn’t get many chances to catch the ball at Auburn, so his skill set was unknown coming into this week. Showed to be a tough matchup in the red zone. Runs well after the catch. Had 1 catch for 9 yards. La’el Collins, G/T, LSU (6-5, 308): Played left tackle for the Tigers. May be better suited either at right tackle or moving inside to guard. Dominating run blocker. Does a good job re-anchoring when beaten in pass protection. Strong player that once he gets his hands on you, it’s over. Tre Jackson, G, Florida State (6-4, 323): Good hand placement. Able to re-anchor in pass protection if he starts to lose the battle. 2014 All-American. Able to reroute defenders. Shaq Mason, G, Georgia Tech (6-2, 310): I love his full name; Shaquille Olajuwon Mason. I guess the irony in that name is that he’s only 6-2. Had a better week than most thought he would. Didn’t have much experience in pass protection, but he showed a good base and held his own in drills. With his build, he might actually be a better center. Arie Kouandjio, G, Alabama (6-5, 318): NFL bloodlines. Brother of Bills tackle Cyrus Kouandjio. Huge frame with long arms. Powerful run blocker than can dominate the line of scrimmage. Struggled in pass protection early in the week, but coaches taught him a short set where he can use his size and power quickly and he improved significantly. Has a great anchor. Has the ability to trap in short spaces. Nasty disposition and finishes blocks. Preston Smith, DE, Mississippi State (6-5, 270): Good pass rusher. Versatile player that can move around and even move inside on passing downs to rush the passer. Blue collar worker. Might be a good fit for a wide 9 scheme. Good bull rush. Had the only sack of the game. Trey Flowers, DE, Arkansas (6-2, 268): Strong player that is able to toss blockers aside. Uses his hands well. Explosive off the snap and can create havoc in the backfield. Owamagbe Odighizuwa, DE, UCLA (6-3, 266): Physical freak that may blow up the NFL Combine. Good speed rusher. Had inconsistent production for the Bruins, flashing on one play then disappearing. Gabe Wright, DT, Auburn (6-3, 299): Shows flashes, but is extremely inconsistent. At times can be disruptive. Has good movement skills and has good lateral movement. Grady Jarrett, DT, Clemson (6-1, 288): Built like a fireplug with short arms. Very quick first step. Low center of gravity and does a good job getting lower than the blocker. Has the ability to beat the blocker by using strength or quickness. High energy. Explosive. Lorenzo Mauldin, OLB, Louisville (6-4, 256): Former defensive end. Improving in his coverage ability. Had a pass breakup. Lynden Trail, OLB, Norfolk State (6-6, 262): Florida transfer. Had an interesting week of practice. Not only did he work out as a linebacker, but he also got some goal line reps as a tight end. Long and lanky. Does a good job in pass coverage. Did a good job shielding off defenders as a tight end in goal line drills and caught a TD pass. Stephone Anthony, ILB, Clemson (6-2, 245): Good in coverage. Runs well. Big hitter. Had a good week. Voted the Best Linebacker for practice week. Nick Marshall, CB, Auburn (6-1, 205): Played corner at Georgia, then transferred to Auburn where he spent the last two years as a quarterback. Originally came to the Senior Bowl to play QB, but at the last minute decided to switch to corner. Great athlete. Was a bit rusty as a corner, but he also did a decent job considering he hasn’t played the position in years. Needs to remember to look back and find the ball on deep throws. Was called for a pass interference penalty. Kevin White, CB, TCU (5-9, 180): Had a really good week. Doesn’t have the size you like in a corner, but he doesn’t get beat much. Very quick feet. Good tackler. Excels in press coverage. Great technique. Patient and doesn’t panic if someone gets behind him. Competitive. Stays in good inside position. Takes on the opponent’s #1 receiver and shuts them down. Tough to fool. Made a diving interception. Voted Best Defensive Back for the practice week. Senquez Golson, CB, Ole Miss (5-8, 178): Doesn’t have great size, but has very good ball skills. Was #2 in the country with 10 interceptions. Cody Prewitt, S, Ole Miss (6-2, 212): Strong and athletic. Can play in the box or in deep coverage. Does a good job jamming receivers when in man coverage. Good tackler in the open field. See ya next Wednesday! If you like what you read, like us on Facebook and tell your friends. This entry was posted on January 29, 2015 by draftmaniacs in All-Star Games and Combine and tagged 2015 NFL draft, 2015 Senior Bowl, Arie Kouandjio, Blake Sims, Brian Bennett, C.J. Uzomah, Cameron Artis-Payne, Clive Walford, Cody Prewitt, David Johnson, Dezmin Lewis, Gabe Wright, Garrett Grayson, Grady Jarrett, Jalston Fowler, Kevin White, La'el Collins, Lorenzo Mauldin, Lynden Trail, NFL, NFL Draft, Nick Marshall, Owamagbe Odighizuwa, Phillip Dorsett, Preston Smith, Rannell Hall, Sammie Coates, Senior Bowl, Shaq Mason, Stephone Anthony, Tre Jackson, Trey Flowers, Tyler Lockett.